Staying in a Canggu Villa holds promise for a lot more than the nearby Kuta nightlife or dining at the many revered Bali-style restaurants in the area. While these experiences are still vibrant and sought after, the surrounding landscape encompasses traditional terraced rice fields and expansive coastal territory. Almost part of the natural environment, the religious and cultural sites throughout the Canggu area also offer a rich historical context to the real and current lives being led there today. The best part is that many of the following experiences can be accessed by walking or motorbiking from your own Bali villa! Let’s explore the various modes of transportation that give you their own unique views of this eclectic town. Before we take off on this cyber-imagination tour of Canggu, it may be helpful to get your bearings in a topographical manner. To get your head around it, you can think of Canggu as having three main beaches with corresponding parallel roads leading to each one. Jalan Pantai Batu Bolong leads to Batu Bolong Beach, Jalan Pantai Berawa corresponds with Berawa Beach, and Jalan Padang Linjong with Echo beach. These three sections can pretty much be considered their own villages that are all bordered by Jalan Raya Canggu on the inland aspect. One of the easiest ways to visualise the set up is to head out to Echo beach, the northernmost of the three, and walk south through Batu Bolong to Berawa beach. They are all essentially the same but are access points to different parts of Canggu. From Berawa there is nothing stopping you from taking a leisurely stroll right down to Seminyak! It might seem far but it only takes about 40 minutes, not counting all the stops you’ll need for fresh coconuts and dips in the ocean. Once in Seminyak, you might check out one of the yoga classes or incredible healthy cafes before making your way back to your Canggu villa. 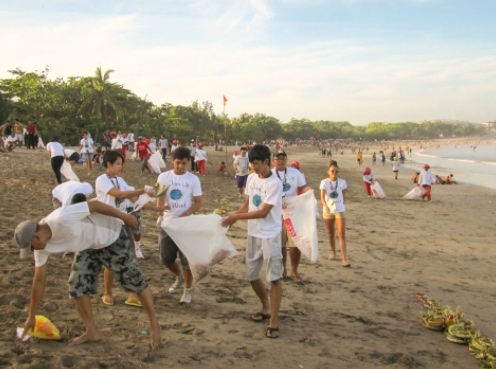 If you are contemplating a beach walk and you’re feeling extra generous, you might consider lining it up with one of the Bali Beach clean-up days. They generally start at Berawa beach in the morning and make their way as far as they can for an hour and a half, picking up non-organic material that is later recycled. Since you know you’re way around the beaches now, you can easily head over there! Check out their facebook page for the dates, often on Wednesdays. There are a few special spots that aren’t technically in Canggu but if you’re staying in a Canggu villa then they are only a short trip away by motorbike, or scooter. Hiring a scooter is an easy and inexpensive way to see things out of town. Generally they will cost around 600.000 Rupiah for a good quality scooter for an entire month! That’s roughly $50 Aussie dollars. You can definitely rent them by the day as well. If you don’t have experience on two wheels or it doesn’t feel like a safe option for you, it’s quite easy to find a private car and driver. The upside to the latter option is that you’ll support the local community and likely get some special insider knowledge of the land and its history! If you go off the main road by scooter there are so many cool little cafes and restaurants justice the one below. The rice field scenery is amazing once you get inland a bit. Yes it can be dangerous but all you have to do is be careful wear a helmut and drive primarily during the day. Other than that you are going to love zipping around Canggu on your scooter. 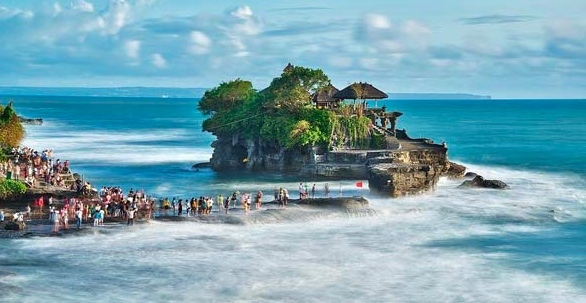 Only about 25 minutes by motorbike or car, the Tanah-Lot temple is one that should absolutely be seen by anyone visiting Canggu, or Bali in general. If you are transporting yourself then you will take the coastal road heading West from Kerobokan until you start seeing the signs for Tanah Lot. The temple was built on a sacred site chosen auspiciously by a natural rock formation off the coast of Beraban and is one of seven sea-side temples. Because this particular temple is strongly connected with the Majapahit Priest of Nirartha, it seems to be one of the most important to Indonesians. While scooters and private cars can get you out of the main hubbub, riding a bike can allow you to squeeze your way into some of the paths that are not accessible by motor vehicle. Bikes will also allow you see a bit more of a particular landscape since you can coast a lot farther and still make it back in time for dinner. Perhaps the most striking and elegant aspect of Canggu is its expanse of surrounding terraced rice paddies. While much of Bali is covered in rice fields, those in Canggu are working fields, still actively used every day. The best times to go are either early morning or early evening because you’ll miss the sweltering heat of the midday sun and you’ll also catch the soft oranges of sunrise or the magenta hues of the setting sun. From town you can take Jalan Padang Linjong until you make a left on the small dirt road called Jalan Pura Blulang Yeh. From this road, if you head inland you’ll see pristine terraces and the unique Balinese irrigation systems. If you go left you’ll make your way past the shimmering wet green fields until you end up near the now-familiar Echo beach! 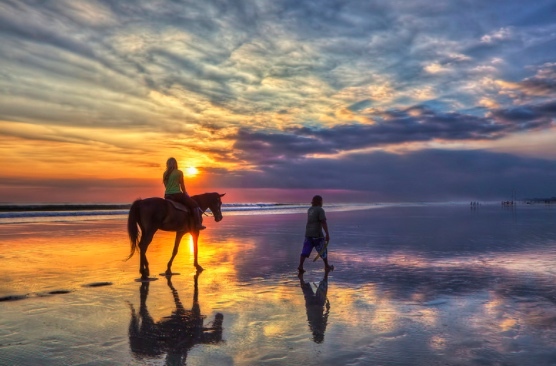 This wouldn’t be a post on what to do from your Canggu villa if we didn’t include a little information on the equestrian scene. Check out places like The Bali Equestrian Centre or Royal Sporthorse Bali and you’ll meet the various lovely horses that can guide you on a magical tour of this lush countryside. Horse rides are offered through the sprawling rice paddies as well as along the stunning beaches. Locals recommend going at sunset along the coastal waters. 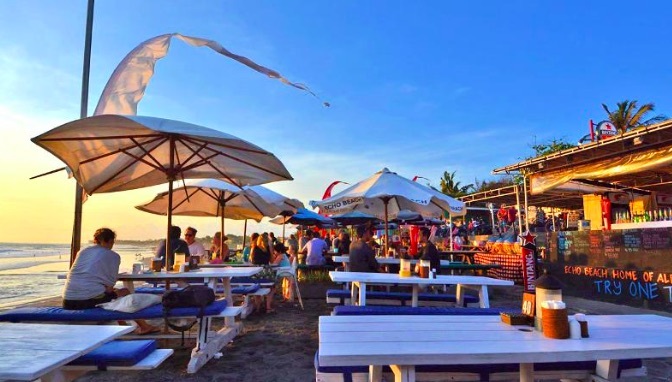 Next time you’re staying in luxury accomodation in Canggu you’ll be equipped with everything you need to know to waltz out of your door and make the most of your stay in this breezy seaside corner of Bali.